When patients visit the Austin dental office of Candace Bruno, DMD, we do our best to create a pain and stress free dental office environment. With gentle, attentive dental care, most patients feel safe, comfortable, and right at home with us. We understand that for some patients, even the gentlest treatment is not enough to make visiting the dentist an enjoyable experience. For those patients who need a little extra help staying relaxed in the office, we may recommend sedation dentistry. If you want to learn more about dental sedation or any of our other services, call our Austin dental office to schedule an appointment with us. We look forward to seeing you soon. When is Sedation Dentistry Recommended? 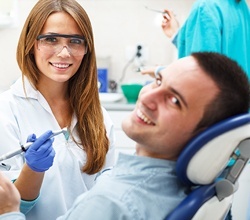 What Type of Sedation Dentistry do You Offer? In order to provide the best sedative option for the most patients, we rely on nitrous oxide. This mild form of sedative allows patients to rest comfortably during any treatment. It also reduces pain, so patients will need less local anesthetic to make a faster recovery. Nitrous oxide is a sedative gas. Originally, this gaseous mixture was used for “laughing parties” where people inhaled nitrous oxide for entertainment. That’s how nitrous oxide got the nickname, laughing gas. Today, this mixture is inhaled to create a relaxed and euphoric state for patients to receive pain free dental care. How Does Nitrous Oxide Sedation Work? The nitrous oxide is inhaled through a nasal mask during treatment. We’ll carefully adjust the dose as we work to ensure you stay completely relaxed and free from pain. You will feel at ease and may be drowsy, but you’ll remain conscious and able to answer our questions and let us know if anything is wrong. 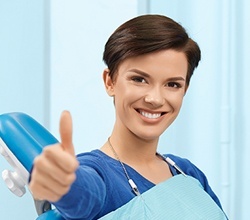 After dental treatment where nitrous oxide is used, you will begin to feel completely back to normal in just a few minutes. We ask that you rest for a little while in the office to make sure you do not experience adverse effects. Then, you can go right back to your normal daily routine.